I’m not your average girl. Several years ago, I was homeless. My ex-husband of 14 years of marriage abandoned us (was having an affair) and went on to have many, many other affairs after that. At one point, he got violent, and the kids and I ended up living in a homeless shelter for physically abused women. Got my own apartment and began creating a life. Making $700/month online at home, selling on ebay, barely enough to survive. A few years later, I was doing really well. Started making $18k/year as a full-time job on ebay and was able to stay home with my kids. I was living my dream life at that point, but not feeling satisfied and fulfilled selling on ebay, God started convicting me to start a blog. I obeyed Him and started SarahTitus.com, what you see today, a week before January 2014. My first year blogging (2014), I started making $10k/month. My second year blogging, I started making $23k/month. 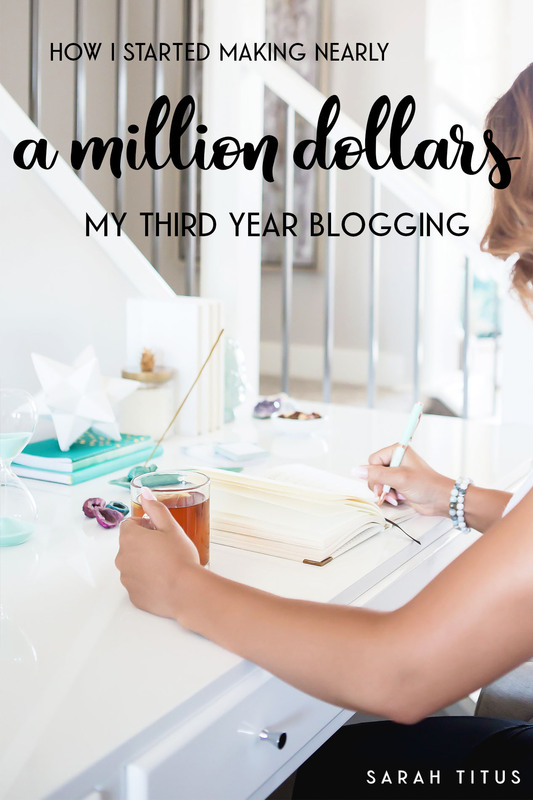 2017 was my third year blogging and I made nearly a million dollars in revenue. In January 2018, I have now hit the 7-figure/year threshold!!! I look back on my life and I never would have, in my wildest dreams, thought I could make so much money from home. I’m just me…a simple, single mom. And yet, all that I have accomplished over the years, from homeless to 7 figures is crazy to me. It’s a pure testament of God’s power in our lives when we OBEY HIM! We cannot see the future. We cannot know what will happen, but He knows what’s best. He knows what WILL fulfill us and make our hearts truly happy and it’s not the money that makes me happy, no…it’s serving all of YOU! Being able to live my dream life, staying home with my kids, serving others, being a part of a team, being a part of something bigger than just me. It’s all really fantastic. The money I make is just icing on the cake. It’s not why I do what I do. Blogging fulfills a part of me that nothing else ever could. I love blogging and I feel like you or anyone else have JUST AS MUCH opportunity as I did to make it. It doesn’t take years and years and years to make these numbers. It takes hard work, dedication, and a spirit that is unwilling to quit. There’s no need to compare where you are right now to where I am. The only thing I want you to see in this income report is what following and obeying God can lead to. Whatever He’s leading you to, don’t wait, don’t put it off, because in one year from now, you could be making $10k/month like I was, instead of not having even started this year! Here’s what the income report looks like for someone who is (now) making 7 figures a year. This year, I made the most affiliate income from: Bluehost, OfferJuice, Amazon, Ebates, and ShareASale. I opened my store (I go through Shopify) on June 1, 2017. My first month having the store, I made $52,060 and got 7,233 in traffics. I was completely shocked. I didn’t realize the power of what having a store could do for my income. I stopped promoting affiliates as much and immediately started promoting my own products. When I did that, it was like the money gates opened up like crazy. My affiliate income went down, considerably. I do want to be transparent in that. From one affiliate company alone, I made $40,000 less this year, however, I more than made up for it with my store. My store produces six-figures a month, all on it’s own. I just started ads up again on my blog. I had them down for quite a long time. So, this figure is very low, but keep in mind, it’s only for a few months out of the year, and when you just start up with ads, they pay pretty crappy. I’m working on getting on with MediaVine at the moment, so that will increase that income, I’m sure. This is the amount I made on book sales on Amazon for the year. I began taking my books OFF Amazon around June, when I opened my store. I wanted everything in ONE place to make it easier on my audience and for me to link to things. I’ve found that I make more having a product in my store, than I did for that same product on Amazon. I was also viciously attacked on Amazon by a known hater and her friends, purposely trying to destroy me. When I spoke to another well-known blogger about it, she said that she has been attacked too. There’s nothing you can do. On Amazon, you can’t fight the reviews, you can’t delete them even when they are not real, and they do affect sales, even when the reviews are not legit. Having your own store, certain apps give you the power to delete a review. This protects you against those haters and takes away their power over you and your sales. My only regret is that I should have started my own store SOONER! I would also want to mention here, as sort of a disclaimer, that while you can delete reviews, bloggers with integrity will not delete very many. I’ve personally only deleted a few. One of which, the lady was lying about everything (store analytics give us tons of real proof) and to try to get even with me, she left a nasty review. Of course, it was deleted, and never seen by anyone but me. There’s also an app in Shopify that lets you block people from buying in your store again, to minimize future drama. I used that app to block her, and I also blocked her on my blog and deleted her from my newsletter. Ain’t no one got time for drama. My life is all about encouraging and being positive, even when things are not going so well. Spread cheer, not hate. Because of those and a MYRIAD of other reasons, I love having my own store over selling on Amazon. I have more control over my store. On Amazon, you can’t block people. So, if someone is a hater and wants to destroy you, they can go on your products and get everything and leave a ton of nasty reviews and there’s not anything you can do about it. The one thing that you’ll notice, is that much of my income is PASSIVE! This frees up my time drastically and allows me to be able to work on projects that are more in-depth and helpful to my audience, the things that I sell in the store. There’s also hired help costs. I now have three assistants. They work a combined total of 35 hours a week, but after this income report, I have now moved them up to a combined total of 80 hours a week. Now that I am making so much, I want to not only give back and help provide for other moms so they can stay home with their kids, but also invest back into the company and grow faster. Stock photos. In December of this year, I spent over $350 on stock photos. I use a combination of my own photography and stock photos. Education. I pay for education. Things like courses or materials to learn. This year, I purchased a $2,000 course and absolutely love it (it’s not currently open, but when it is, I’ll share the link). I also just purchased an Instagram course in December that I want to go through, to up my game on Instagram. Systematizing EVERYTHING. At the beginning of this year, I started systematizing absolutely everything. I started batching work. Doing certain similar tasks with other similar tasks and staying on track. I started closing out a lot of loose ends that were good, but not great, and sucked up my time FROM those great things. As I started closing out loose ends, I was further able to work on more important things, like creating products you guys will love. Upped my email list game. I started with ConvertKit and LeadPages this year and got those things connected and started really focusing more on my email list. Currently I get about 8,000-10,000 new subscribers every month, but I also delete cold contacts regularly too. I just deleted 17,000 subscribers off my list in December. I really love my email list. I try really hard to give something free in it every single week, whether that be a binder or something else really cool. Adding new systems. I’ve found what works and now it’s just about adding more of what works. If I see one newsletter subscribe sequence works, I add more just like it and do that same system with as many of my newsletter subscribes as I possibly can. Working on printables, new binders, courses, and bundles. I’m working on releasing a course about how to make six-figures in your store at the moment. I’m also currently working on an essential oil binder. I just finished changing the Hope Binder into a coloring binder (per reader request- which will release soon), and my essential oil DIY binder into a coloring binder, a Fitness Planner, and a Valentine Binder. I just LOVE making printables! Most all of the products you see in the store were created this year. I take one project at a time and just bust it out, launch it, then work on the next. One after the other. Hired two assistants. I hired my most recent assistant in December. Now I have three assistants on the team total helping out and doing this has really allowed me to be more focused and work on what I enjoy doing. I think that it’s not only important to show you my successes, my goals and plans, but also where I’ve failed. There’s a huge misconception out there that I never fail and that’s simply not true. I do fail. I succeed more than I fail, yes, but I do fail. Every 60 days, like clockwork, I go through and look back and see what’s succeeded and what’s failed. This has really helped improve my business over time. If you don’t currently do that, I’d highly suggest it. WithCoach (now called Podia). Early on, when I started testing my Shopify store and WithCoach, my own store just sold more. The exact same items, the exact same prices, etc. and my audience just liked my store better for some reason. I tested that thoroughly and finally pulled the plug on WithCoach. While they are an amazing site and I believe in them wholeheartedly and promote them (because they are seriously awesome!!! ), for my particular audience, they preferred my store by a landslide. This just goes to show that every blog is different, and what works for one, may not work for another. LeadDyno App. I go through LeadDyno for my affiliate store program and while at first, the platform was clunky and it wasn’t giving me the options to really do what I wanted to do, over time, as I started working with customer service more, I learned there are a LOT of cool tricks that it can do. So, for the first many months, it was totally failing, but, I chose not to give up on it and to really try working it and now it’s doing fantastic! This proves that something can start out as a failure, but grow into something truly successful! Zendesk. I was really excited to try this company, but when I joined, found it completely too technical and too much work to keep going. I ended up closing the account and having one of my assistants help with all emails. She is a Pastor’s wife and knows all about taking care of comments and concerns. It’s been fantastic having her on board, as is the whole team! Twitter. I started trying to play the Twitter game this year, but so far, only around 1,900 followers. I’m not seeing growth in that area, so I stepped back and stopped posting as much. I started moving my social media efforts to Instagram. I like it better because it doesn’t limit my characters as much as Twitter does and it’s a lot more magazine-like with pictures. My Instagram is slow-growing as well (around 700 followers right now), but it still is gaining more traction than Twitter was. I’m super happy for your success, blessings, and accomplishments! You work super hard, are always growing, you give tons and tons to your readers, you are constantly evaluating what’s working and not and looking to improve, and your diligence is mighty inspiring! You have a great story of rags to riches but you also have an amazing story of faith, of following God, giving glory to God for the blessings you receive, and are constantly pointing to God with a heart of humility and gratitude for all that you receive. Thank you for always showing that God can make all things possible and your journey is super exciting to behold! Great job, Sarah! Thanks for sharing everything! Very inspiring! I will try some of these ideas when I do a little more research. I wish to have many streams of income from the things that I love to do. Your blog is great. When exactly did you start your Etsy store? You typed June 1, 2018. Thanks for responding. Do you have a mailing list that I can sign up for that will notify us of your course on Shopify? Absolutely. 🙂 I will announce it to my audience when it goes live (within the next couple months) so any email list will work. But here’s one for a bunch of free printables. Sarah this article was incredible! I love your writing style as it is so personal and transparent. We are in the process of creating a shopify store now. I ran one a few years back but did not know what I was doing. Now that we have the traffic 80k-100k page views a month I think it will work great. What have you found to be the best way to drive traffic to your store from your blog? Thank you for the encouraging and kind words. I’m glad you enjoyed the article, and hope you found it helpful. Really, I don’t do much from my blog. I just put the products in a few posts as applicable, with links. I also have two links in my navigation bar. Hope this helps. Good luck with your new Shopify store! There is so much inspiration in this post but what I love most is your trust in Him. I think it makes all the difference in the world when we stop trying to have so much control over the direction of our lives and start trusting in the direction chosen for us. Thank you for sharing! This is amazing. I barely have a couple views per month, but I’m already wondering… what the heck would I even create if my blog ever got to that point? Way to go, mama! Hello Sarah, I really love the re-vamp! I’m trying to follow some of your steps and working on a blog. Are you still using a Genesis framework for this new blog? Still trying to sort out the whole SEO game. I definitely used your Bluehost link, so you can great credit. Thanks for all your sharing! “I ALSO have an affiliate option for my store.” I clicked on that link but all I got was a black blank page. I’m not sure what happened. I’d love to find out about your affiliate program!